It’s a trend that has left us dermatologists cringing. Despite a clear message, “reduce sunburns by using sun protection,” the latest summer craze has individuals now purposefully burning their skin to create fast skin art. Using lacy clothing or creative cut-out patterns, a sunburn creates the negative image while protected skin remains light. The resulting redness and later bronzing leaves the pattern emblazoned on the skin, simulating a UV-induced tattoo. Sadly, however, these artistic endeavors are painted on a canvas which doesn’t tolerate burns well. The effects of today’s “sunburn art” may well be DNA damage leading to later skin cancers. Literature cites that 1 million people develop skin cancer each year. And, greater than 65% of melanomas and more than 90% of other types of skin cancer can be attributed to damaging effects of UV radiation. When outdoors, it’s important to follow sun safety recommendations. The American Academy of Dermatology offers these sun tips: avoid high-sun between the hours of 10am and 2pm. 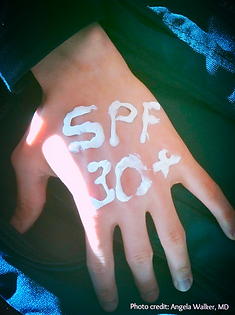 Apply UVA/UVB broad-spectrum sunscreen, at least SPF 30, protection liberally. 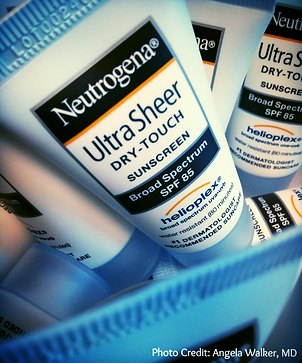 Remember to reapply if skin gets wet with sweat or swimming, and it’s important to reapply every two hours when outdoors. Self-tanners offer browning of the skin without increased risk from UV radiation. Additionally, small, largely inconclusive studies have suggested that the use of oral or topical botanical extracts with antioxidant properties may offer some sun protective effects. This may be important research to follow as larger studies are completed. For teenagers and young adults who might be most likely to pursue sunburn art fads, might I offer: If ‘orange is the new black’, fair is the new tan. Though tattoos have risks too, skin art might be better painted with tattoo dyes or henna. If you’re interested in creative summer fun: how about teaming with friends to compete for shade structure grant funds for a local community center or school? More than 320 now exist across the country, providing shade to more than 600,000 each day. Be a proactive part of decreasing skin cancers and earn recognition and admiration for your work.